Discover our different workflows for exosome research and find the one that fits your experimental needs. Exosomes belong the to group of extracellular vesicles (EV) and play a key role in cellular functions. Consequently, they are of great interest in basic research as well as in future diagnostic applications or clinical settings. We offer a reliable isolation method that safes time, capital equipment, and high starting volumes (50–100 mL) – a true alternative for conventional ultracentrifugation. Using our Exosome Isolation Kit, enrichment of EVs has never been easier. Isolation from multiple sample types e.g. cell culture supernatant, urine, plasma, serum, ascites etc. 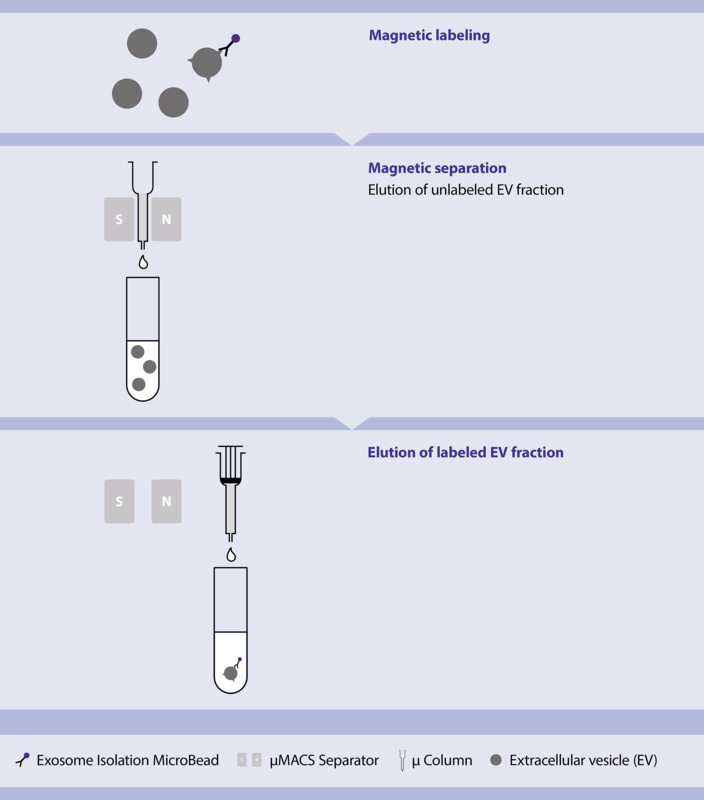 Principle of magnetic isolation of EVs using the Exosome Isolation Kit. Subpopulations of EVs can be separated using superparamagnetic MACS® MicroBeads. For example, NK cell EVs and platelet EVs can be separated using CD81+ and CD9+ MicroBeads. Western blot analysis of NK cell EVs (left) a mixture of NK cell and platelet EVs (middle) and platelet EVs (right). Ctrl. : Loading control of 1.7 μg NK cell EVs (left), a mixture of 0.8 μg NK cell EVs and 1.7 μg platelet EVs (middle), and 3.3 μg platelet EVs (right). CD63-MB, CD9-MB, CD81-MB: EVs isolated with CD63, CD9, or CD81 MicroBeads (25 μg NK cell EVs, a mixture of 12.5 μg NK cell EVs and 25 μg platelet EVs, and 50 μg platelet EVs were used as starting material for magnetic sorting). CD29, CD81, and CD9: detection antibodies. 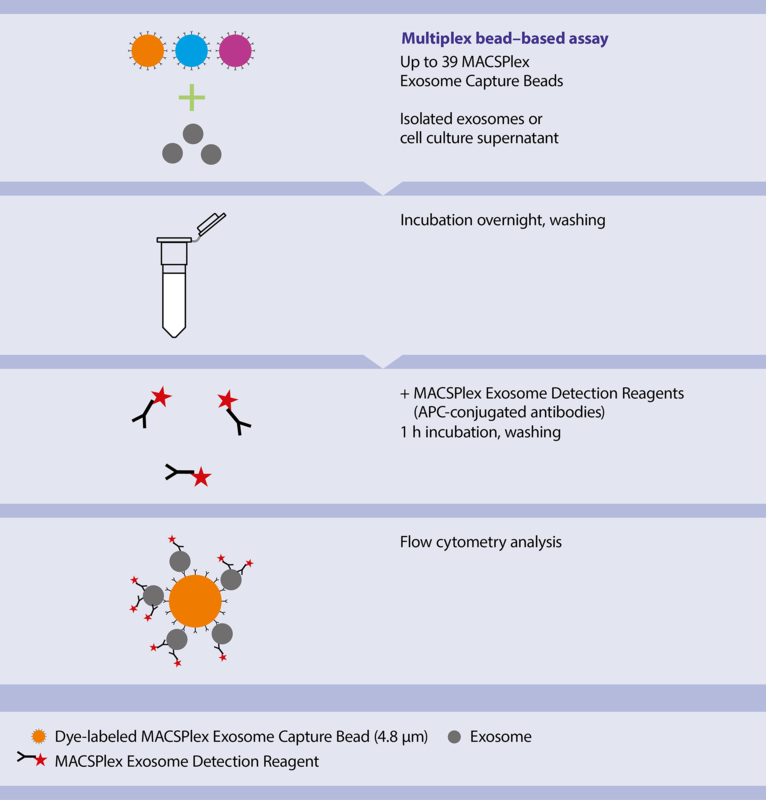 For further downstream analysis of exosomes we have established the MACSPlex Exosome Assay. This multiplex bead-based assay consists of capture and detection antibodies to analyze the composition of exosome surface proteins in a given sample by flow cytometry. Express Mode – Automated acquisition and analysis in combination with the Express Mode on the MACSQuant® Flow Cytometers. Workflow of the multiplex bead platform. Isolated exosomes or cell culture supernatant were incubated overnight with up to 39 different bead types, each coupled to a different capture antibody. The different bead types were labeled with one of two dyes or different proportions of both dyes, so that all bead types were distinguishable by flow cytometry. Exosomes bound to the beads were detected with CD9-APC, CD63-APC, or CD81-APC antibodies or with a cocktail of these antibodies. EVs isolated from cancer cell lines can be discriminated by differing markers from tumor entities. EVs from melanoma cell line for instance show different surface markers then EVs from colon cancer cells as demonstrated by binding to the respective MACSPlex Exosome capture beads. 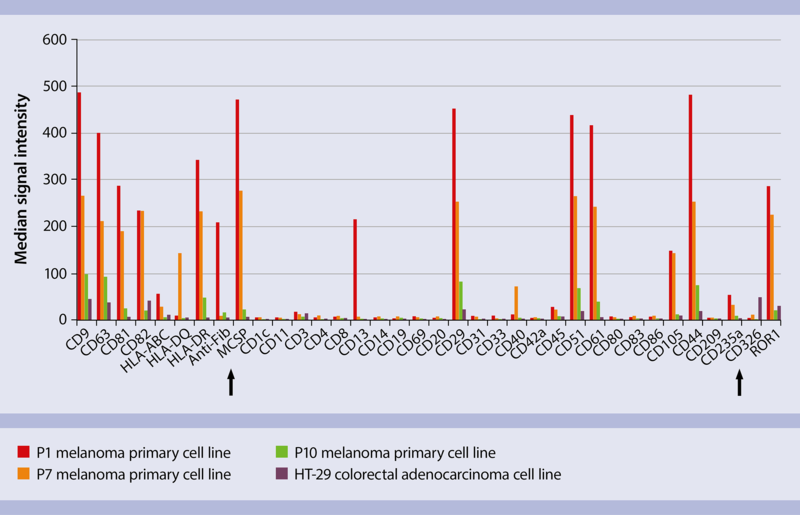 Surface marker profile of EVs isolated from primary melanoma cell cultures or HT-29 colorectal adenocarcinoma cell line. Shown is the APC median signal intensity of different capture antibody bead types after incubation with 4 ug EVs, followed by staining with a cocktail of CD9-APC, CD63-APC, and CD81-APC antibodies. Join Dr. Stefan Wild and his webinar on exosome analysis, explaining exosome detection by flow cytometry and introducing the MACSplex Exosome Assay. Join John W. Ludlow, Ph.D., Executie Director of ZenBio Inc., and his talk at the AACR annual meeting 2017. Melanoma affects the composition of blood cell-derived extracellular vesicles. Koliha, N. et al. (2016) Front Immunol 7: 282. A novel multiplex bead-based platform highlights the diversity of extracellular vesicles. Koliha, N. et al. (2016) J Extracell Vesicles 5: 29975.